You can follow the debate live in Davos. Watch Special Conversation with Enrique Peña Nieto, President of Mexico here at 14.15 on 22 January 2016. 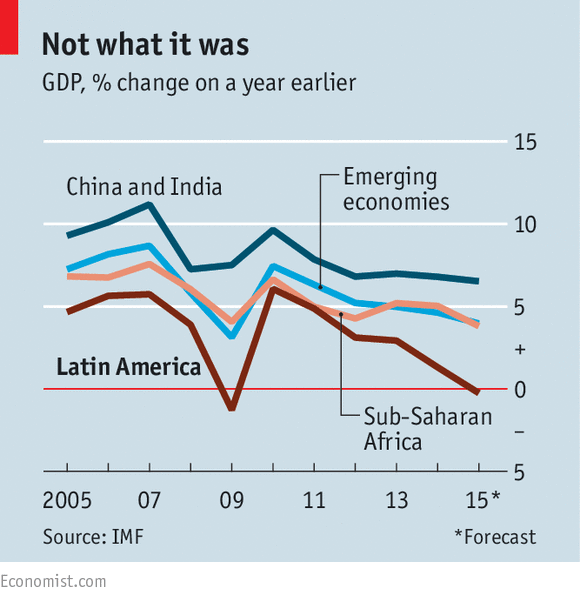 After a decade of high growth thanks to the commodity super cycle, Latin America has lost its glow: economic growth is near zero, equality gains have stalled, and the political landscape is changing. While individual nations in the region are faring differently, all Latin American countries are facing a challenging economic climate. The IMF’s revised World Economic Outlook projected in October that the region’s economy would contract by 0.3% in 2015. This updated the IMF’s previous prediction of 0.5% growth. The China-led commodity boom which powered much of South America’s growth during the 2000s has slowed sharply since 2013. Low oil, coal and iron ore prices have hit the region hard. Inflation and unemployment have risen. The bleak picture is partly due to a steep recession in Brazil – projected to be a contraction of 3% by the IMF – and slumping commodity prices. Other factors include a strengthening US dollar relative to national currencies and weak domestic demand. Venezuela’s economy, which the IMF expects to have shrunk by 10% in 2015, is currently experiencing inflation which has soared close to 100%. 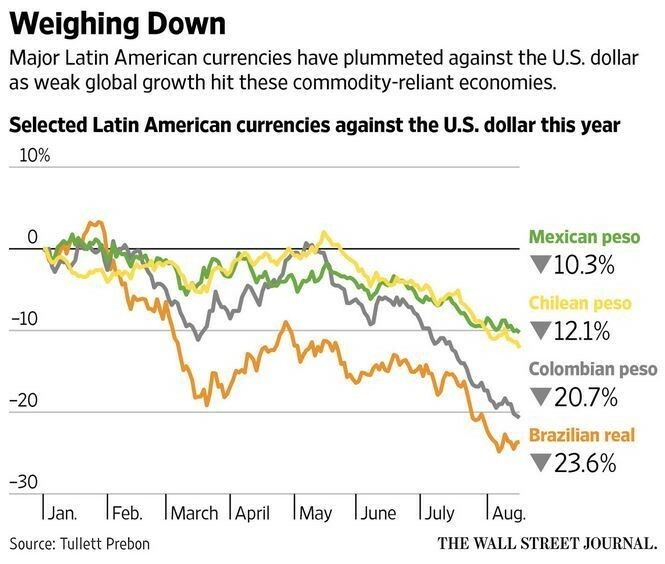 As well as recession in Brazil, Mexico has been experiencing slower than expected growth. Argentina was expected to see some growth but has its own battles with high inflation and falling GDP. Many Latin American governments have seen revenues drop and social instability rise. A wave of discontent has put the left-of-centre governments that have dominated South America’s political landscape for more than a decade on the defensive. A mix of scandal, voter fatigue and economic difficulty have created an apparent widespread desire for change. The IMF expects the region to recover in 2016 to expand by 0.8%. 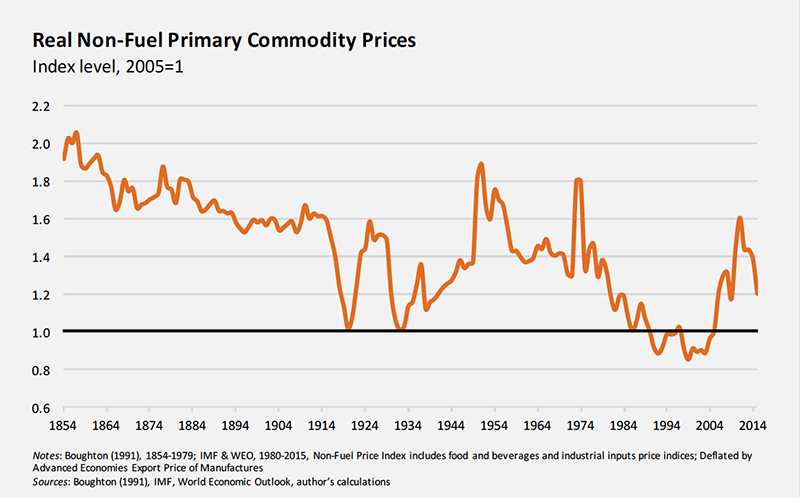 The downturn is not expected to have an impact as deep as previous commodity downturns such as the debt crisis of the 1980s. With some exceptions, Latin American countries have much lower external debt ratios and greater international reserves. This allows for greater flexibility in monetary policy as well as access to capital markets which reduces the likelihood of needing international loans which often carry heavy austerity requirements.